Hardest hit under Trump’s new proposal would be Sound Transit’s Lynnwood Link project, which stands to lose nearly $1.2 billion in federal funding, half of the project’s entire cost. President Donald Trump proposed $200 billion in new infrastructure spending on Monday, while at the same time reiterating his desire to slash funding on public transit infrastructure in Washington and across the country. For the second consecutive year, Trump’s proposed budget would eliminate federal funding for future transit lines throughout Washington state, from Seattle’s downtown streetcar, to light rail between Northgate and Lynnwood, to a six-mile bus line in Spokane. Both Trump’s budget and his infrastructure plan face very long odds of becoming law. While Trump asked for similar cuts to transit programs last year, the bipartisan budget agreement reached last week bears little resemblance to Trump’s proposal. 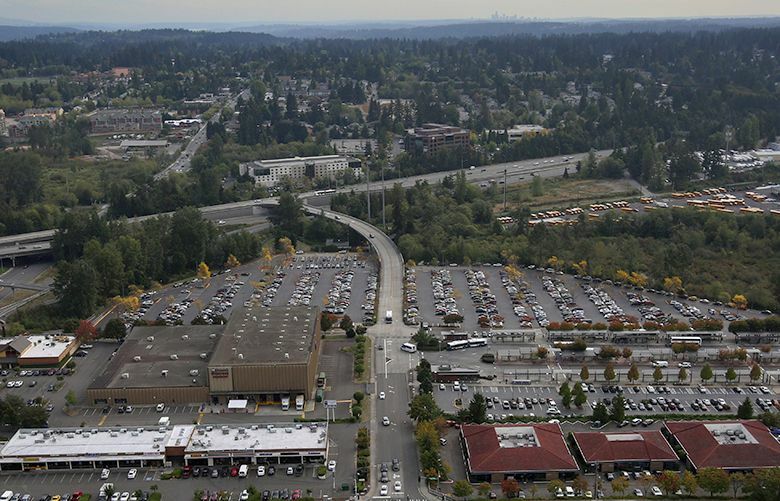 • Lynnwood Link light rail, from Northgate to Lynnwood, $1.2 billion grant. • Federal Way Link, light rail between Angle Lake and Federal Way, $499 million grant. • Tacoma Link light-rail extension west of downtown, $75 million grant. • Center City Connector streetcar along First Avenue in Seattle, $75 million grant, but only $25 million in jeopardy. • Madison Street RapidRide bus line in Seattle, $60 million grant. • Spokane Transit’s Central City Line bus-rapid transit, a six-mile east-west route through downtown, $54 million grant. • Swift 2 bus rapid-transit, from Canyon Park through Mill Creek, South Everett and Paine Field areas, $48 million grant. • Roosevelt RapidRide bus line in Seattle, through Eastlake and South Lake Union, $35 million grant. Some estimates said the infrastructure cuts in Trump’s proposed budget were as large or larger as the new spending he proposed. Sound Transit’s light rail line between Angle Lake and Federal Way would lose nearly $500 million. In total, eight Washington transit projects would lose funding under Trump’s 2019 budget proposal. Those projects are all in the pipeline to receive New Starts grants from the Federal Transit Administration, but none have received final approval yet. Nationally, 70 transit projects are seeking or anticipating New Starts funding, but only 13 have received final approval. Trump’s budget would eliminate the New Starts program, preserving funding only for projects that have received final approval. Sound Transit CEO Peter Rogoff, in a phone interview Monday, said he was “greatly disappointed” in the budget proposal, but he was hopeful Congress would not go along. Rogoff said he met with four different congressional committees last week and members of both parties, and he did not hear support for proposals to cut transit grants. Sound Transit has done analyses of how much cuts to federal funding — or to car- tab revenues — might delay the project but would disclose and discuss those at a future board meeting, he said. As part of the budget, Trump released his long-awaited infrastructure plan, a broad outline that would spend $200 billion in federal money over the next 10 years, aiming to leverage local, state and private dollars into more than $1 trillion in additional spending. Every Washington transit project that Trump’s budget would cut was proposed by local transit agencies and already includes local funding. Rogoff also vented at the infrastructure initiative’s specific allocation of money to rural roads. It’s unclear if the $200 billion proposed in the infrastructure plan would outweigh the infrastructure cuts elsewhere in the budget. A study from the University of Pennsylvania’s Wharton School of Business, comparing new infrastructure spending to Trump’s proposed infrastructure cuts from this past year (which are similar to this year’s) found it was essentially a wash.
Far from the $1.5 trillion boost that Trump is touting, the study found that on net, infrastructure spending could be cut by as much as $55 billion over 10 years. And there are elements in the infrastructure plan that could be particularly harmful to Sound Transit. For instance, no more than 5 percent of the new funding could go to fund projects approved before the infrastructure plan went into effect. That would severely curtail the funding available for already approved Sound Transit projects. And the infrastructure plan would allow federal funding to cover no more than 20 percent of an individual project. Gov. Jay Inslee highlighted that Trump’s infrastructure plan counted on states, local governments and private spending for 85 percent of its money. The infrastructure plan also envisions selling off government-owned assets, such as airports and highways, if agencies think that private operation of the facilities would help taxpayers. It specifically cites the Bonneville Power Administration’s transmission facilities, which provide power to broad swaths of the Northwest, as an example of what could be sold off. “I will not support legislation that attempts to use smoke screens and fake math to privatize projects and enrich Wall Street,” Sen. Patty Murray, D-Wash., said in a statement.